It’s time to find your inner animal spirit at Leo Vegas! Last week the casino launched a new video slot called Jungle Spirit: Call of the Wild and since the provider is NetEnt you can be sure to find a brand new promotion. 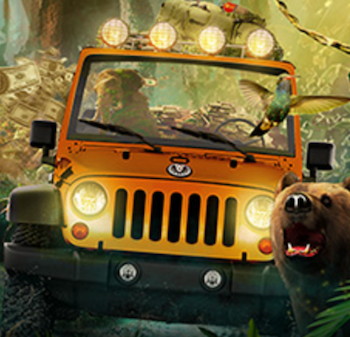 There are prizes worth over £100 000 including cash prizes, free spins and last but not least a Jeep Wrangler! If you want to participate in this cool campaign you will have to log in at Leo Vegas and start collecting tickets as well as points to the weekly leaderboards. Leo Vegas will give away cash prizes and free spins to the players entering the leaderboard every week and on the 24th of April there will be a big draw. Take a seat at 6:00 PM at the Celebrity Black Jack table in Leo Vegas exclusive Chambre Séparée if you want to see who the lucky winner of the Jeep Wrangler is! For every £10 you wager during the promotion you will earn points, tickets and free spins. You can choose to wager the money on selected video slots gathered under “jungle games”, in Leo Vegas live casino or on sports. If you wager £10 on your desktop you will get 1 point to the leaderboard, one ticket to the draw and 5 free spins on Jungle Spirit. However – if you choose to play at Leo Vegas mobile casino instead you will get 2 points, two tickets and 10 bonus spins. The fun goes on every week until the 23rd of April at Leo Vegas – make sure you check it out before it’s too late! Until the 31st of March you can play live Roulette at Leo Vegas in order to have the chance to win a fantastic trip through Europe. Just log in and play at the live Roulette tables from Extreme Gaming. The more money you wager on the live Roulette games the higher you will climb on the leaderboard. The player who ends up on top of the leaderboard in this competition will get to go on a seven day tour together with a friend. Leo Vegas 1st prize includes flights, accommodation and sightseeing in London, Paris and Rome! If you end up and winner and don’t want to go on the Europe tour you can choose to get a cash prize instead. Also the players on 2nd and 3rd place will get cash prizes without wagering requirements.